Semi Auto Strapping Machine (Heavy Duty Machine) offered are precision designed and developed machines that are suitable for meeting the strapping needs of books, cartons, packages (soft & hard) as well as articles in a square and cylindrical options. These machines find suitability with high tables and for general objects. Further, these can also be developed for medium height tables suitable for larger or heavier packages. A strapping machine with a very low table is suitable for the packages that are very large or heavy. Some of the specifications these can be customized in include Cycle Time, tension range, Strap Width, Sealing Method, Reel Inside Diameter, Table Height, Layout Dimension and Weight options. Our company Shri Vinayak Packaging Machines Private Limited, established in 2000, is regarded as one of the pioneers engaged in importing, manufacturing and exporting a huge assortment of Packaging Machinery. 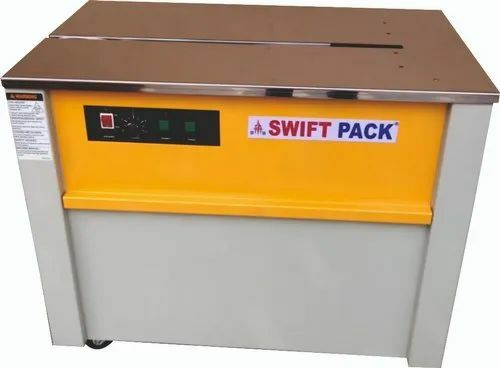 The wide range of products offered by us include Carton Sealer, Strapping Machine, Sealing Machine, Shrink Packaging Machine, Vacuum Packaging Machine, Stretch Wrapping Machine, Batch Coder, Conveyor System, Material Handling Equipment, Filling Machine, Cup & Meal Tray Sealer, L-SEALER, Electro Magnetic Induction Capper, Liquid Packing Machine, Cling Film Wrapping Sealer and Cap Closing Machine. These engineering products offered by us are widely used in the garment industry. We are actively supported by a team of diligent and proficient workers. They are able to understand the diverse application requirements of different engineering industries and offer suitable range of products. With our adroit and well-experienced research and development department, we are able to offer highly reliable and innovative range of products. Thus, these products are widely appreciated in the markets for its unique features such as superior quality, durability, efficiency and are very easy to use and maintain.